A – God wants me to ACCEPT my children. My observation that my kids were really different from me in many ways was awkward for me at times to acknowledge in a gracious, faith-filled way. Jesse wanted to play drums in a bad way and lost interest in basketball; I thought he was good at basketball. Most of my kids don’t like classical music like me (even though we played classical music most mornings during their independent schoolwork time); they prefer other styles. Megan decided our family fashion needed updating, for herself AND for her sisters. Practically overnight jumpers disappeared! I admit, at first I felt either a bit sad or offended observing the differences in my kids. God was kind to show me, however, that He is the One who made them. He has given each one of them the interests and natural abilities they possess. Once we realize we can trust God for the way He’s made our kids, we can encourage and help our children develop the gifts and passions He’s given them, even get excited about them. When Jesse arrived home with his first drum set he bought at age 17, I ran out to welcome him, even encouraging him to practice (just not after 10pm at night!) And today he’s an outstanding, self-taught drummer who I truly love to hear play for his church worship team. As for Megan’s passion for fashion? I took her shopping for new clothes and makeup and jewelry to encourage her in her desire to get with the times. She really does have a great sense of style! A great resource to help you discover your kids’ natural abilities and interests is Don and Katie Fortune’s Discover Your Children’s Gifts. R – God REACHING the hearts of my children should be my number one priority. My greatest desire is for each one of my children to have an authentic, passionate relationship with Christ, and to live their lives with abandon for Him and for His glory. Working through some of the ways my children are different than me, nevertheless revealed I had a tendency to place a disproportionate emphasis on their outward performance. Focusing more on the externals of what I could see in their behavior, and not enough on the motivation of their hearts, it was all too easy for me to think that if they were acting obediently, their heart must be in the right place. Working to reach the hearts of my kids was for me then, and still is the hardest part of parenting! It means I need to listen more and judge less, not give in to fear when problems with outward behavior do arise, and ask questions when I’m tempted to assume. Jesus is the best example for us, as parents, in how to walk with our children in a way that helps us reach their hearts – He opened up His own heart to His disciples, He shepherded them in prayer and with gentle truth, He walked alongside them, and He laid down His life for them. He can give us grace to do the same. T – Teach them the TRUTH. 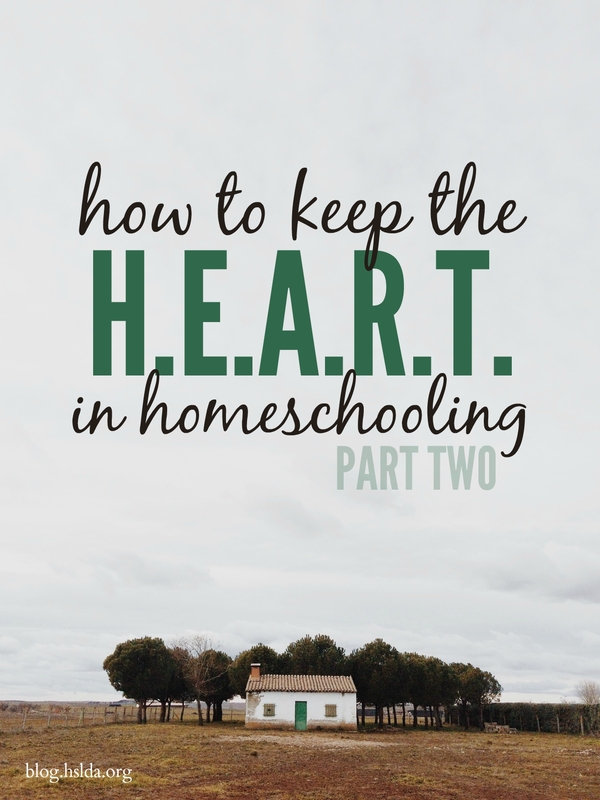 When I started homeschooling my kids, I showed them how to read and write, instructed them God how to do math, and taught them a lot of other subjects. We read the Bible together as a family, too, yet God wanted me to realize that the best thing I can ever give my children is the truth of His Word. We are uniquely positioned to give our children His Words, and present them with a view of the world around us that is accurate, based on the truth of the Bible. My late husband took this seriously and was an excellent Bible teacher in our home. Since his death in 2009, I’m aware I should have done more to actively teach God’s Word to my youngest son, even though I’m not the spiritual head of my home. Unfortunately, I’m no Bible scholar, and I regret my lack of confidence to teach him further than I did. While I’m thankful for how my girls actively look to God’s Word to guide their lives, I’m in a season of prayer that God will give my boy—about to turn the corner into manhood—a hunger and thirst to know His Word well. If you do only one thing consistently well, do this. Give your children the truth of the Scriptures while you can, mom; all the world’s knowledge can’t compare with this priceless gift! What a Encouragement. My Husband and I have been over a private school for quite some time, God took us a different way this year, with Homeschooling. I know his ways are higher than ours, but I sure do feel inadequate, I want the best for them, but with Gods help and guidance, I know I can do this. Thank You for your courage, and Testimony, because I cant imagine losing my Husband, and having all of that on my shoulders. I AM so glad I found this article. God Bless You !!! Welcome to homeschooling, Joy! You are absolutely right about being able to do this with God’s help and guidance…that’s what has helped me through the years. He is faithful!